With a 19 year history as the industry leader in solar PV (photovoltaic) panels, Solarcentury is one of the most respected solar companies in the world. 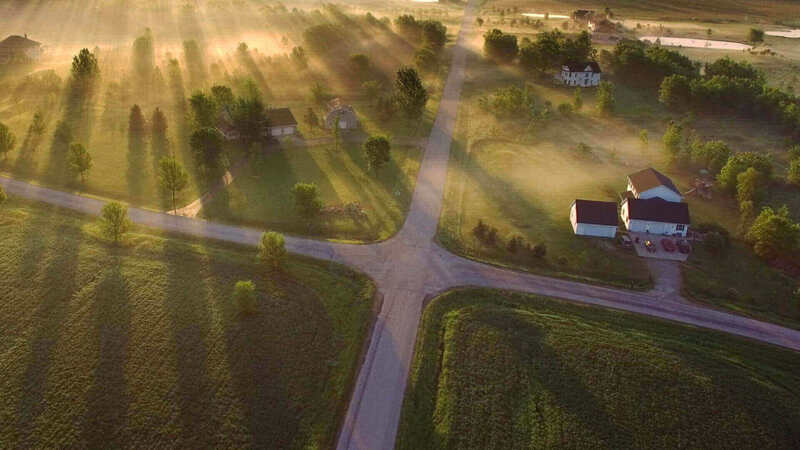 As it approaches its 20 year anniversary, Solarcentury is at an exciting stage, growing further into an international utility-scale solar developer. The company now operates across four continents and finances, develops, constructs, owns and operates its own large-scale projects. All of this is underpinned by a mission that resonates with our own – to be a leader in delivering a zero carbon world quickly and economically. This, as they say, is the solar century. We first worked with Solarcentury in 2016, when we helped them create a website to showcase SunStation, their award-winning building-integrated PV panel. Since then we have followed their journey closely, and recently chose their charity SolarAid, to be the recipient of our self-imposed carbon tax. So, when we were offered the chance to collaborate on the redesign of their main site ahead of their milestone anniversary, we couldn’t wait to get started. 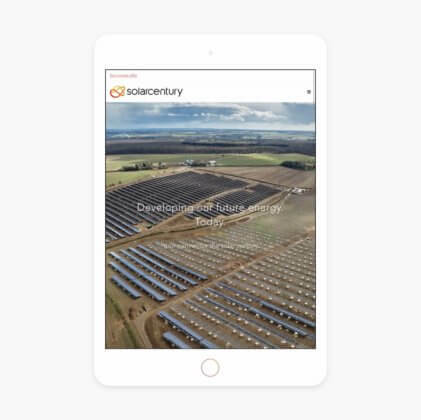 Solarcentury needed a complete redesign of their website to reflect the evolution of the business. The new site needed to have a stronger focus on the corporate services presented to stakeholders such as investors, banks and government, while separating out the consumer information for the various target markets across the world. Following a thorough discovery session, during which we mapped out the key user requirements for the site to ensure that both the needs of the organisation and its customers were fully understood, we began creating the designs for two websites: One corporate website and a consumer facing site, to meet the needs of the two types of users. 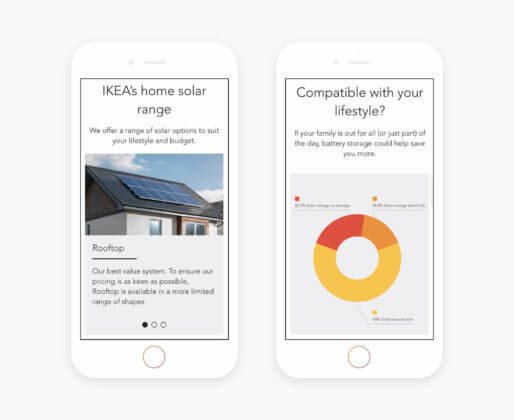 Using an atomic design process, our designers worked closely with the team at Solarcentury to develop custom designs for each page template, to meet the needs of the visitors to individual pages. The designs for all key landing pages were then tested with EyeQuant attention analysis software to ensure they would have the intended results, before we moved on the the development stage. 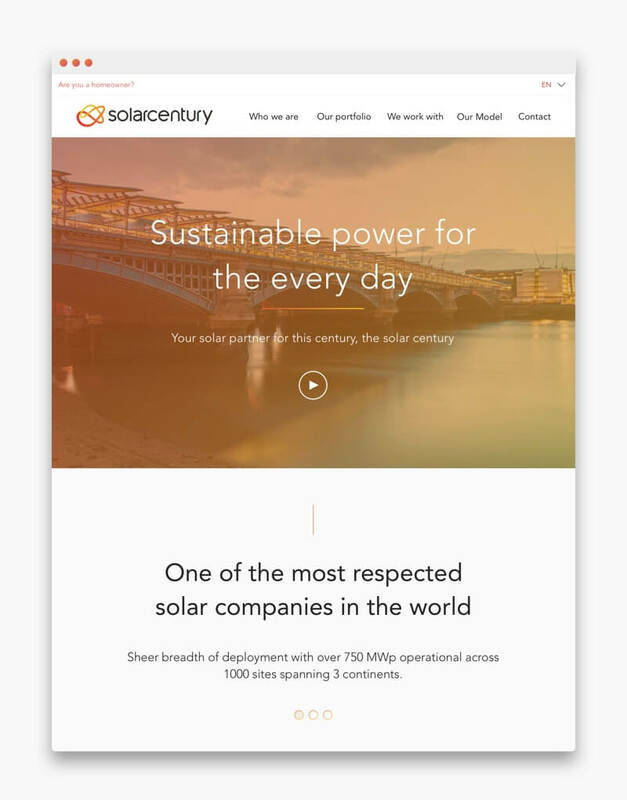 The corporate site needed to have multi-language functionality, so that the Solarcentury team would be able to input content in different languages. The consumer site needed a multisite structure so that each country would be able to have its own sub-site with independent content, but manageable within a single CMS. Although the two sites have different user requirements, much of the functionality was similar. To meet the needs of both the corporate and consumer sites, we developed a flexible WordPress theme that could be configured to meet the needs of each website. Finally, to highlight the difference Solarcentury is making globally in the fight against climate change, we integrated a calculator on the main landing page, showing in real time how much electricity has been produced by Solarcentury and how many kilograms of CO2 this has prevented.